A Wonderfully Versatile Welsh Male Voice Choir! 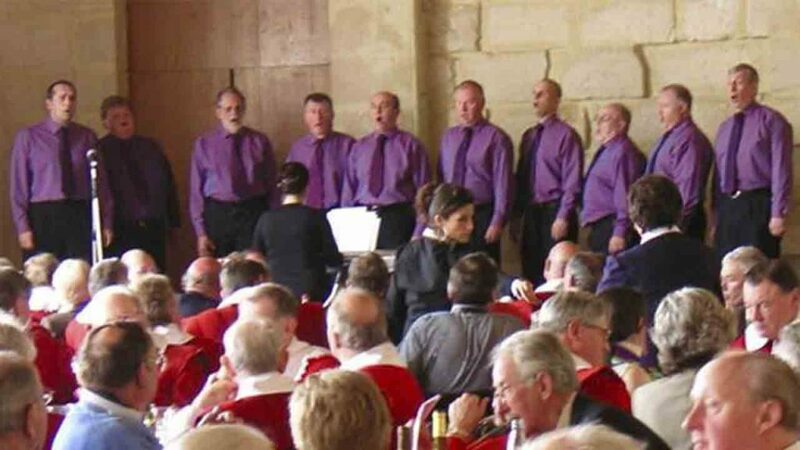 Hims and Arias is a versatile welsh men's voice choir that performs in events and any occasion. Aside from performing traditional pieces, rest assured that this welsh choir can perform any pieces to suit any occasion. On top of this, this male voice choir is accompanied by an amazing pianist Meryn Williams and Hims and Arias is a person-with-disability friendly so rest assured that you will be getting the most out of your performance experience from us. Musical Director: Meryn Williams - a talented pianist and music conductor. In 2001, Meryn Williams, B Mus. Hons., formed a small male voice chorus with the aim of bringing music and fun to the community. There were 9 men in the original choir – 6 of them still members today. The choir was named the “Minnesingers” – the original Minnesingers being troubadours who flourished in the 12th and 13th centuries, travelling around Germany writing and performing their own songs – mainly love songs. The 21st century Minnesingers had a much wider repertoire of traditional songs and hymns in English and Welsh, folk, modern, classical songs and ballads, and songs from the shows. Meryn was committed to developing a small choir which could both serve the local community and be able to perform at a range of events – including Weddings, Concerts, Dinners and other celebrations. The choir have visited France, Italy, Spain and Hungary – performing for audiences from 20 to 500 in number, and at venues including Concert Halls, Cathedrals, Hotels and Vineyards. The choir changed it’s name in 2016 to “Hims and Arias”- and while our repertoire is still drawn from across the centuries, there is a greater focus on the music of the 20th and 21st centuries. The members of Hims and Arias – currently 14 in number – thrive on the challenges set for us by Musical Director, Meryn. We enjoyed performing in our first male voice choir competition in North Wales in November 2016. We missed out on third place and a prize by 1 point – with encouraging feedback from the judges. We had 11 members performing on the day – with all other choirs in the competition having at least 30 members on stage. We occasionally perform with ladies choir “Vocelle” – also led by Meryn. The two choirs perform separately on such occasions – coming together to provide a mixed chorus for songs from the shows and for some hymns and traditional Welsh songs. We consider ourselves very fortunate to be an amateur choir with a brilliant professional musician as our Musical Director. If you want to develop your talent in music and learn a wide arrangement of music genres, then join us! Our current practice night is a Sunday evening from 7.30 to 9.00p.m. We practice at Llanharry Church Hall. If we are preparing for a major concert we occasionally rehearse on a Thursday evening in addition to Sundays. To bring a world of difference to the music that we bring to the audience. Hims and Arias is feeling blessed. Very proud of the guys last night. The concert at Trehill Vale of Glamorgan was well received and deservedly so. A lovely crowd of people and a very supportive audience.